You can still win twenty-five picture books for yourself or your school. Learn more about the ABC Giveaway. Willow has a lot to say — she just can’t seem to say it loud enough. When it’s time to speak up to get a seat at the table or the right kind of juice, Willow only manages a whisper. With her father’s unconditional support, Willow comes up with a solution. A handmade magic microphone allows her to find her loud voice — and also to find out that she doesn’t even need a microphone after all. The charming story is illustrated with simple cartoon characters against a white background, keeping the focus on the message. 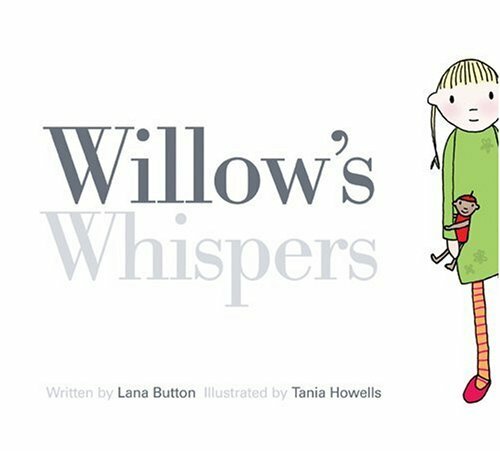 This book would be great in classroom and preschool settings, including storytimes, or with a special quiet child waiting to find that strong voice within. Give this book with a Magic Mic or look for more Ways to Give a Picture Book or over a hundred other Ways to Give a Book this holiday season. Blow, and blow, and blow, and blow. How I like a breeze! Blow them through the sky. Watch the clouds roll by! All of these look like books to check out from the library for us! I have really been enjoying your selections and a bit sad the alphabet only has 26 letters. It seems to me that Winter books should be out there...but nothing comes to mind! I love Whistle for Willie. A Weekend with Wendell, however, I find disturbing. Nightmarish, even. "Hooway For Wodney Wat" by Helen Lester is fun to read with older kids. The Three Little Wolves and the Big Bad Pig by Eugene Trivizas! The Wide-Mouthed Frog by Keith Faulker is just begging for a group read aloud with the big pop-ups. The best read aloud I used to do at a bookstore was Wild About Books. I'm surprised I don't have a favorite whale book, since we love whales. Wave by Suzy Lee is a super fun, wordless picture book. and of course, Where the Wild Things Are by Maurice Sendak. My preschoolers are learning about animals in winter. We started the week by reading "Animals in Winter" and exploring with some different stuffed animals. I second "Wave." I dearly love Suzy Lee. As a child, I always loved Bill Peet's Whingdingdilly about a dog who thought he wasn't good or special enough until after an encounter with a witch left him as a little bit of many animals. Another favorite was Wacky Wednesday by Dr. Seuss. It's fun to find all the things that are wrong in the pictures of that book. Weslandia is great as well.